I spent part of my weekend attending the sporting events of some of my current students. I usually try to do this once a semester. I'm not the biggest of sports fans, but I do try to be supportive. Inevitably, too, I find myself thinking how little I actually know about my students' lives. Sitting in the stands I always catch snatches of conversation and realize that 'so and so' is dating 'what's his name.' I even get a sense of the ever-evolving groups and subgroups that make up a small campus community. I like to think I have a good rapport with my students, but as a faculty member my connection exists almost entirely in the classroom, a space I structure and over which have a nominal (if not actual) authority. The classroom is in many ways an artificial world and has its own peculiar rules and routines. Put me in a classroom and I am comfortable and at home, but put me in a social situation with students beyond the classroom and I usually feel awkward and self-conscious. What on Earth do we have in common? As a result, I tend to observe Star Fleet general order # 1 when it comes to socializing with students: there must be no interference with the internal development of alien cultures. For a few years my office was on the same floor as a student resident hall. Sometimes coming into work, or stopping by the office on a weekend, I would happen onto students necking or having a beer party in their rooms. One morning as I was coming down the hall, a student was scurrying back from his shower wrapped only in a bath towel. I was the alien in these situations. I was on their planet, so I carefully observed the Prime Directive and pretended not to notice. It's just better that way. Many years ago a friend and I ran a small theater company. Together we staged a dozen or so productions in various halls and church basements. We had little money, crap equipment and only the talents of high school kids, bored homemakers and the usual assorted misfits who make up amateur theater. My friend Ray and I were young, arrogant and completely enamored by the ideas of Constantine Stanislavsky. I think back and often wince at our youthful pretension, but there were also some fascinating moments. One project I recall with particular fondness. We had decided to offer an "imagination workshop" using Stanislavsky's ideas. We advertised it in the newspaper and charged an absurdly low amount in the hopes of attracting new talent to our troupe. It worked, too. Nearly a dozen people signed up. Are you in a building of some kind? And on we would go. Essentially, we were using two aspects of Stanislavsky's theory: the Magic If and Given Circumstances. Stanislavsky saw the imagination as a problem solving instrument. We don't just close our eyes and go on flights of fancy. Rather, our imaginations respond to the question what if and then feed off more facts and information. Unfortunately, playwrights often supply very minimal information about characters and settings (e.g., "Harry, young man, smokes a lot."). Consequently, actors have to create a lot of information for themselves. The trick is to make these given circumstances interesting enough to arouse the imagination's interest in answering the question "what would you do if you were this person and this were so?" I recall one evening in particular. Ray began with that simple question: what would you do if you were cold. Then he kept asking more and more questions to get the actor--in this case a middle-aged woman--to supply ever more detail. He had her touch every object in the room, feel the texture of the bedspread, describe what was outside each window. The key was to get her to select details that were interesting to her. In the course of an hour and a half, Ray and the woman had created an amazing scene. She imagined she was a widow who had come back to a her family's lake cabin for the first time since her husband died. Her children were grown now, but the family had spent many summers together at the cabin. Now it was late fall and the place needed to be made ready for winter. It was two-thirty in morning and the woman had awoken only to find that the fire had gone out. The scene involved her rising from bed to gather wood and restart the fire. Then she sat watching the flames grow, wrapped in her husband's old coat, his scent still on it. All of this Ray teased out of the woman's imagination by asking what would make this interesting to you and how would you feel if... The final scene lasted only five minutes (it seemed longer as I recall), but it was riveting. The actor was completely focused and convincing. You saw each memory and emotion pass through her expressions. 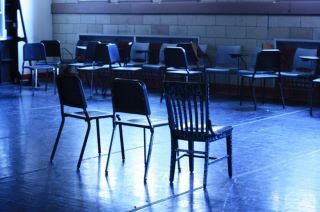 There was an entire life displayed on that empty stage, and the scene really resonated with metaphors of life and death, warmth and cold, memory and loss. Indeed, something beautiful, almost poetic, had been created from the simplest of questions: what would you do if you were cold. The thing I most recall about these Thursday night classes was the almost electric sense of creativity in the room. People often remarked that they left the class more energized and pumped up than when they had arrived. I did a lot of pretentious things as a young man, but I don't think this was one of them. We had really hit upon something interesting. I just wrapped up an eight-week accelerated night version of the core capstone, a course in which students are asked to evaluate the significance, value and meaning of their liberal arts education. Teaching it in our evening/weekend program is always a challenge. Many of the students in the program are working adults finishing degrees in career-related fields. They take two courses, two nights a week, in eight week stretches; then they turn around and do it again the following eight weeks. Generally, too, they are doing this while working full-time, raising a family and dealing with life in general. This semester, for example, one was going through a bitter divorce, another had absences because his kid had run away, one woman gave birth, and another was supporting a boyfriend with legal problems. Most work all day and then show up to class half exhausted only to listen to me gas on with liberal arts happy talk. To be fair, some are sincerely energized and interested by our discussions. They even tell me they are surprised by how engaging they find the course. Others, however, just go through the motions. They have accepted the ritualized annoyance of higher education: blathering professors, core requirements and just bloody getting through with it. They don't complain much; they just yawn, scroll through their text messages in class and wait for it to be over. Some nights I'm right there with them. More than once over the past eight weeks I've kvetched to my long-suffering partner how I dread going out again after a full day's work (especially since I did not want to teach this extra section. I had no choice--couldn't find anybody to take it). Socrates once said, “The unexamined life isn’t worth living.” Before taking this course I could not fathom philosophy. The whole idea of everything being open to interpretation and what I thought were meaningless questions seemed like a waste of time. It was my flaw to neglect that without questioning the way things are being done now, things will never change. I used to think that the purpose of an education was to help start a chosen career, but my reflections in the analysis of our meaningful college classes changed that. I anticipated and enjoyed plenty of accounting classes, but never appreciated the value in my liberal arts education. It was momentous for me to notice a pattern in where my growth was coming from. Not only was this my favorite assignment, it was the most meaningful. We ended the night as I always do by discussing a selection from Frederick Douglass' autobiography. 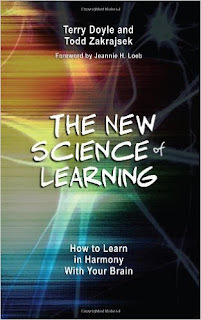 It's the two chapters in which he describes his clandestine efforts to teach himself how to read. He had overheard his master say that teaching a slave to read would "forever unfit him to be a slave." 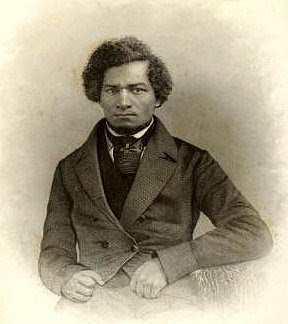 After that, Douglass was determined to unlock the source of the white man's power. That secret, of course, was that slavery was not a fact of nature; it was a monstrous crime perpetrated against him by people who were no better than he was. At the end of the capstone, students often ask me for my definition of a well-educated person. I usually agree with Douglass' master: someone who's been completely ruined for slavery. I don't know if that's what we ever accomplish in higher education, but I would like to think so. One of the challenges for me over the past few years has been trying to minimize the importance of grades in my classes. All of the research shows that extrinsic rewards (or punishments) are actually disincentives. Economists have known for years that offering higher rewards for anything beyond simple mechanical tasks leads to poorer performance. Rewards just don't work the moment you ask people to do even rudimentary cognitive tasks. I've blogged on this before (When A's Don't Matter). I don't have the power to eliminate grades. They are still (and probably always will be) the coin of the realm in higher education. Even so, there are some things I've been able to do to de-emphasize them and put the emphasis on what really does motivate people: autonomy, challenge and mastery. People--bless their little hearts--don't really like to think all that much, but they will do it if they are confronted with an intriguing challenge and have the freedom and autonomy to go about the work the way they want. They also love to see themselves getting better at something. So for the past three years I've been using my Humanities 101/102 sections to see how much I can infuse these ideas into the existing grade-dominated paradigm of higher education. The first week I have the students select personal learning goals. I ask them what they want to get better at by the end of the semester. I put their goals in my grade book and come back to them when I respond to papers. I want to recognize any progress and stress that my role is to support them, to challenge them and to offer strategies for success. Just as importantly, I want to celebrate achievement. Indeed, I eliminated the final exam (such a nasty sounding phrase) and instead turned it into a recognition of achievement. For example, you mentioned that Oedipus ran away in an attempt to outwit his fate. Okay, good. So who else tried to outwit fate in the texts we’ve read? Did Kronos try to avoid being overthrown in Theogony? Did Achilles try to have it both ways? And what about using Socrates for a contrast? Did he run away or face his fate? Come to think of it, Hector also accepted his fate in the end. And how might any of this relate to Hellenism’s concern for what it means to lead the best kind of human life? This response could go a hundred interesting—and fascinating—inter-textual directions. Look for larger patterns. Part of achieving your goal (improved critical reading) is placing what you're reading into the larger context of the course's themes and ideas. What do you think? Is this ripe for revision? I also think you can beef up textual support. Look where I’ve placed this mark: (#). I’ll tell you when it’s too much. Right now, we’re not quite there yet. There are some other minor issues we can work on. Here’s a challenge for you. I want you to Google “using commas with introductory elements” and try to figure out what this is. Check out a few grammar web sites and see if you can eliminate this error. Set this as a minor learning goal. And take action on your own. Believe me, you’re going to feel really, really good about yourself when you slay this beast. People just like getting better at stuff. 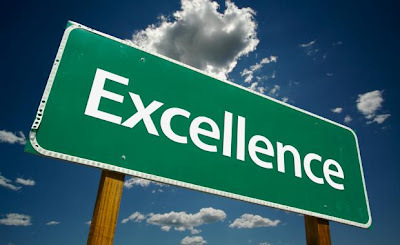 It's what those pesky old Greeks called areté, or achieving our potential for excellence. I have a long way to go, but I feel like I'm onto something. If nothing else, it keeps me from getting stale. I've been doing this job for 20 years and still feel like I'm only now figuring things out. One of these days I might even get good at it.